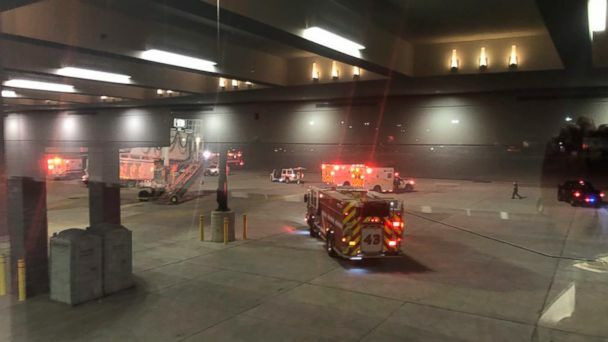 Six people were hospitalized with non-life-threatening injuries after an aircraft bridge at an airport in Baltimore failed, officials said. Just before 8:00 pm. On Saturday, the southwest flight 822 from the Dominican Republic arrived at Baltimore-Washington International Airport Thurgood Marshall (BWI). Paramedics met the flight to "assess a medical situation on board that occurred during the flight with a passenger," said a spokesman for the Southwest. "While medical personnel were supporting this passenger outside the aircraft, the airport's passenger loading bridge experienced failure," the spokesman said. "While working to get the passenger off the plane, the jet bridge that serves the flight gate failed," a BWI spokesman said in a statement. "Six people were injured in a fall." The injured were transported to local hospitals according to BWI . Victor Ferreira BWI Fire Chief, said on Twitter that "affected personnel were taken to precautionary hospitals to be screened for minor injuries as a precaution."